After releasing almost 8 beta versions, today RARLAB released the final version of WinRAR 5 and WinRAR 5 final (stable) version is now available for download for all PC platforms (windows, Linux, Mac) in almost 34 languages. The new version fixes several bugs that appeared in beta versions of WinRAR 5 , as well as the new version introduces new features and performance improvements. The new version works faster compared WinRAR 4 and occupies less space in memory. Interface wise you will not find anything new, however if you insist you can apply different themes available at developer website. The standout feature in WinRAR 5 is the introduction of a new archiving format called RAR5, the new archiving format will strengthen compression algorithm, and provides better encryption. 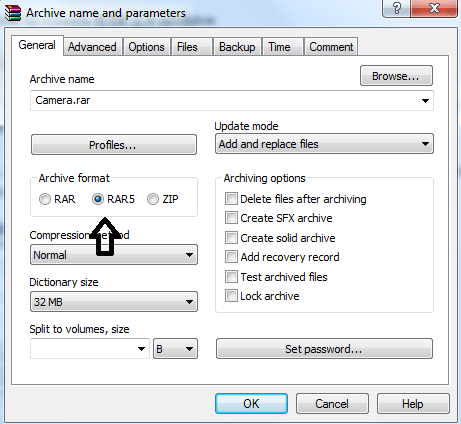 RAR 5.0 archiving format algorithm supports up to 1GB of (maximum) compression dictionary size on 64-bit systems and the maximum compression dictionary size on the 32-bit systems is limited to 256 MB ( in Windows XP the limit is 128 MB). Also RAR 5 brings 256-bit AES encryption which is theoretically stronger than AES-128 encryption.Not only this WinRAR 5.0 also adds new recovery record format based on Reed-Solomon error correction codes, this provides higher resistance to multiple damages compared to RAR 4 recovery record. These are the key features of the new version, still there are many minor features in this new release, you can read the full list of features on the developers page. File compressed with RAR 5 archiving format cannot be decompressed by older version of WinRAR and other softwares like 7-Zip or winzip. Features such as authenticity verification and support for file comments are removed. How to create a RAR 5 Archive File ? First install the new version of WinRAR, next right-click on the file you want to compress , then choose add to Archive option in the context menu. Next select the Archive format as ‘RAR 5’ (instead of RAR 4) on archive name and parameters dialog and proceed to compression by clicking on “OK” button. 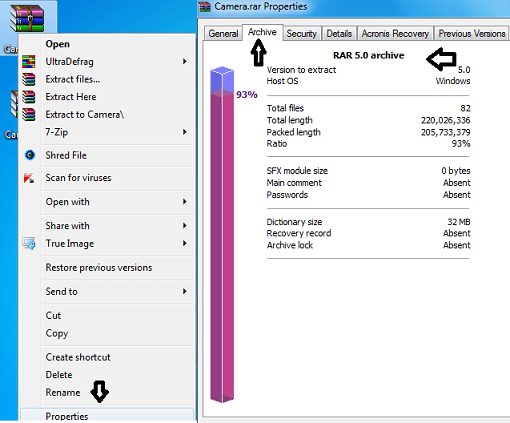 As I said before files compressed with RAR 5 and RAR 4 archiving format will get same .rar file extension. It will be difficult to recognize a .rar file archiving format, for instance if you received a rar file through email and you are seeing errors such as “cannot open file” with 7-zip or other errors with an older version of WinRAR, then it’s time to install WinRAR 5.0. If you have installed winrar 5, then just right-click a .rar file, next select ‘Properties’ in the context menu and click on Archive tab, you will find the version of archive format. So to avoid these type issues, for now we suggest you to use RAR4 archiving format to compress files (if you share them on the web) until RAR5 format gets more popular. Although Winrar can be used even after the evaluation period of trail (40 days) by skipping pop-up window requesting to upgrade the product, but my most preferred free software for file compression and de-compression is 7-Zip. Interestingly 7-zip software already has certain features that are introduced in WinRAR 5 version, it has AES-256 encryption and supports 1024 MB dictionary size. So I thought to compare them, for the test I used a folder/file which contained only images,the file size is 209 MB. For the test purpose, I used my Samsung NP550P5C-S02IN (powered by Intel i7 processor with 8GB RAM) laptop running on Windows 7 OS, first I compressed the file using WinRAR 5, selecting RAR 5 archive format, normal compression method , dictionary size as 32 MB, the compression took around 19 seconds and the compressed file size is 196 MB. Again I tried to compress the same file with the same archive format, dictionary size and changed compression method to ‘Best’, now the compression time is reduced to 14 seconds and the compressed file size is 196 MB. Now I turned into 7-zip software for compressing the same file , under normal compression method ( dictionary size 16 MB) it 49 seconds to compress the file and file size is 194 MB. Where as in ultra compression method it took around 1 minute to compress the file and the file size is 194 MB. Next I thought to decompress the file with two softwares, WinRAR took around 43 seconds to decompress the file in the 7-Zip format (.7z), whereas for decompressing the rar file it took mere 3 seconds. Further I moved to 7-zip software, for decompressing the .7z file it took only 17 seconds and for now it’s not possible to decompress RAR5 file using 7-Zip. In this Mini visual test, although 7-zip is capable of reducing the (compressed) file size to further 2 MB compared to WinRAR, but in terms of speed WinRAR 5 is the clear winner and in the technical side , 7-zip lacks features like recovery record and archive truncation, but still I prefer 7-Zip to daily use as it’s free and more than enough for my usage. Above is my personal view, so it’s up to you to decide which is better or you can use both of them to attain better results and compatibility.